Through last-minute maneuvering this week, both Anbar and Nineveh managed to get new provincial councils seated before the end-of-Ramadan holiday begins in Iraq. This means the process of forming local governments following the local elections earlier this year is complete across Iraq (with the exception of the KRG and Kirkuk where no elections were held). The Mutahhidun bloc of the Nujayfi brothers (Parliament Speaker Usama and Governor of Nineveh Athil) expressed satisfaction with both these new local governments, reflecting the fact that they played a key role in forming them. That is something of a comeback for the Nujayfis, who had seen a substantial drop of votes on their home turf in Mosul in the elections themselves. Whereas it seems clear that much wheeling and dealing has been involved and Mutahhidun among other things were forced to cooperate with the Kurds in the Nineveh council (they had marginalized them in 2009), Mutahiddun now clearly does emerge as something of a leading party in the Sunni-majority parts of Iraq from Anbar via Nineveh to Diyala, and with some decent representation in the Baghdad council as well. What happened politically is that the Nujayfis in both governorates managed to win people from the Karbuli and Mutlak factions over to their side in order to neutralize potentially hostile blocs. This is a significant victory for the Nujayfis since these are precisely the factions of Iraqiyya that have been more disposed to cooperating with Maliki in the past. Other parties with a greater potential for working with Maliki than the Nujayfi camp – including the bloc of former Anbar governor Fahdawi and the list of the Yawer clan in Nineveh – in the end remained marginal and on the sidelines of these new local government formations. Maliki can now probably only count on Salahaddin among the Sunni-majority governorates for some potential support. The council formations in Anbar thus cements the role of Nujayfi as some kind of unifying figure in the Iraqi north-west, and to some extent compensates for lost prestige resulting from the marked decline in votes in Nineveh itself. Even though it is debatable whether the Nujayfis personally enjoy the same level of influence in Anbar and Diyala as in Nineveh, this turn of events does seem to signify the return to the agenda of some of the radical rhetoric that characterized protest movements in Anbar earlier in the year. With Nujayfi stronger, these parts of Iraq are inevitably drawn closer to Turkey, the Kurds and Sunni oppositionists in Syria than what might have happened with an Anbar governor closer to Maliki. Still, these were local elections only. There has already been talk about the emergence of a potential alternative to Maliki in the shape of an inter-sectarian alliance between his opponents; yet back in 2009, many tentative alliances that were floated during local council formation never grew into anything enduring for the subsequent parliamentary elections. It is that crucial stage of national elections, scheduled for 2014, that will henceforth take centre stage in Iraqi politics. -The relative success of Prime Minister Nuri al-Maliki in defending his strong electoral result from the previous local elections in 2009. Whereas his State of Law coalition has lost some seats in many governorates, it is still the biggest seat-getter almost everywhere in Baghdad and the south. 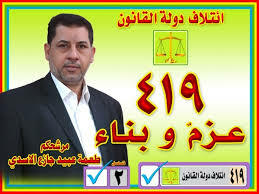 Apart from the capital, Maliki has particularly impressive results in Basra and the far south. 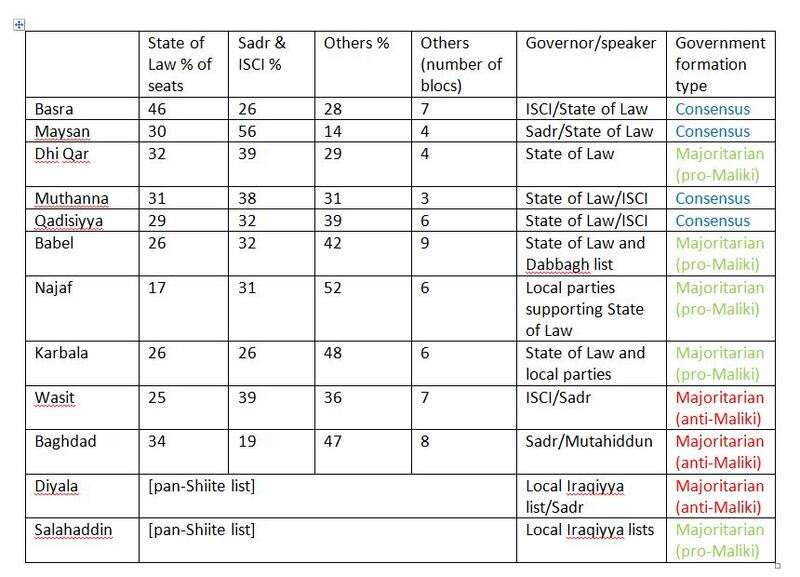 Still, the fact that some seats have been lost despite a broader coalition of Shiite parties (Fadila, Badr and the Jaafari wing of the Daawa all ran with Maliki this time) indicates that there has been a certain disadvantage of incumbency at work. -ISCI, as represented in the Muwatin coalition, has made something of a comeback compared with its dismal performance in 2009. This is most pronounced outside the shrine cities, in provinces like Basra and Wasit. The comeback is all the more impressive given the relatively recent split with Badr, and could perhaps testify to a relatively successful process of reorganisation on the part of ISCI in the wake of the break-up. -The Sadrists appear to be at a standstill, not making significant progress apart from winning back Maysan and gaining some new seats in Wasit. -The Mid-Euphrates generally sees higher political fragmentation than the far south of the Shiite-majority areas, with much more room for local lists – including most spectacularly in Najaf where a local list came first. -The strong performance of the all-Shiite list in Diyala is quite remarkable and possibly a testament to increased sectarian friction in the area. 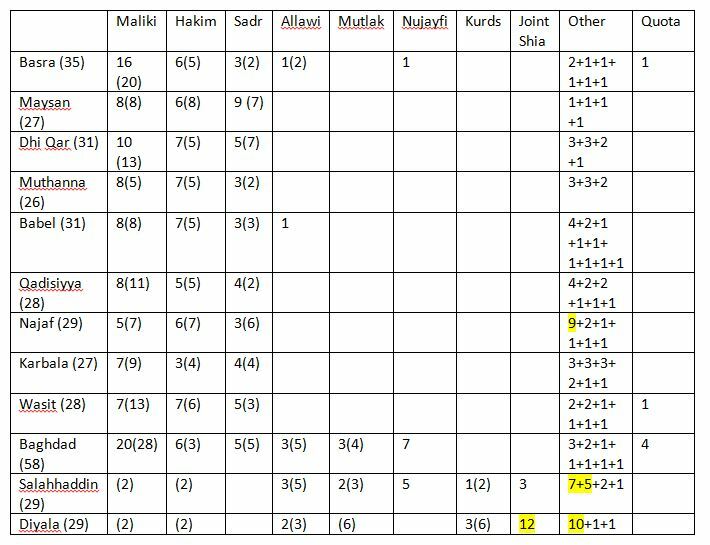 The figures for the Kurdish list in Diyala seem too low in this source and are contradicted by other sources based on earlier counts. -With respect to the secular and Sunni camp, the single biggest difference with 2009 is the disappearance of the Sunni Islamist Tawafuq coalition, whose members are this time enrolled in various factions of the Iraqiyya movement, including most prominently Mutahhidun headed by Usama al-Nujayfi. -In Baghdad, Nujayfi’s Mutahhidun has emerged as the second biggest list, thus inheriting the role of Tawafuq and to some extent marginalising the mainline Iraqiyya faction on its own home turf. -In the other Sunni-majority governorates where elections are held – Diyala and Salahhadin – it is noteworthy that there is also considerable fragmentation and local lists have greater success than Allawi. In Salahaddin, Jamahir al-Iraqiyya was the biggest winner, whereas in Diyala, Iraqiyyat Diyala came first. The latter reportedly includes people closer to the Mutlak and Nujayfi camps. It is now expected that final results will be published in two weeks, when the complete seat configuration as well as the identity of each new councillor will be known. At that point, the process of forming new local governments across Iraq can also begin. Whereas the previous list of candidates for Iraq’s 20 April local elections had 8,099 names, the updated list published today has 8,138 names, meaning 39 more candidates have been approved following appeals processes, including de-Baathification appeals. The changes are too small for elaborate statistical analysis similar to the one that was possible for the initial list, but the revised table of excluded candidates does show the same tendencies as regards conflicts between political entities and the elections commission IHEC as before the appeals process. The Sunni-majority governorates have been subjected to most exclusion of candidates, and the Iraqiyya list is also the main casualty. It is noteworthy, though, that both Saleh al-Mutlak and Usama al-Nujayfi have been somewhat more successful with their appeals than Ayyad Allawi’s mainline Iraqiyya list. 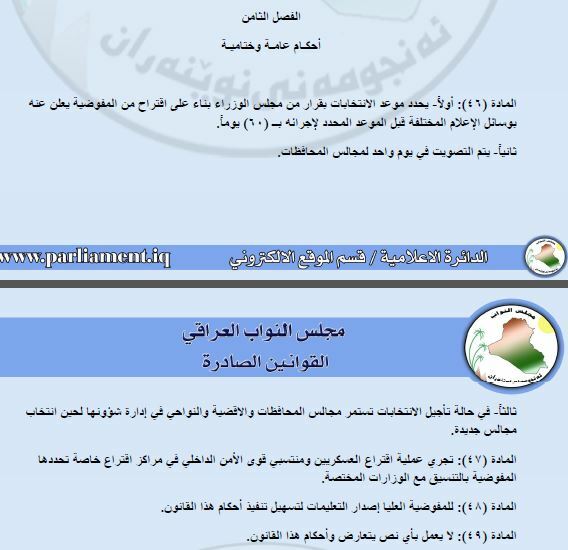 Some symbolically important appeals successes include the reinstatement of the top candidate of the Mutlak list in Baghdad and number 3 of Nujayfi in Nineveh. 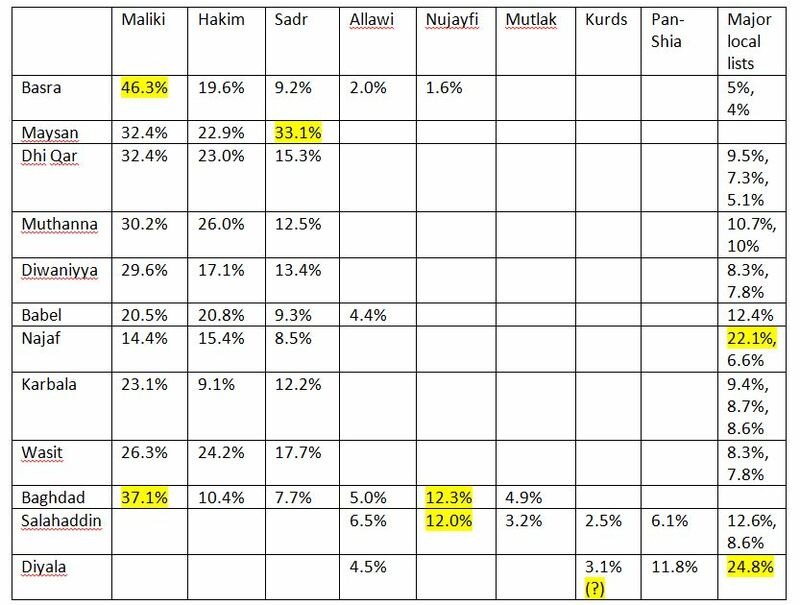 Conversely the top candidate of Iraqiyya in Anbar and its number 5 in Nineveh and number 6 in Karbala remain excluded. Maliki had only problem with a single candidate (in Basra); he was reinstated. Since Mutlak and Nujayfi had relatively few candidates excluded in the first place, it is perhaps not worthwhile to push this finding too far. Politically, of course, Mutlak is at the moment engaging with Prime Minister Nuri al-Maliki by returning to cabinet (alongside the Hall faction), whreas Nujayfi remains in opposition to Maliki (Iraqiyya has reportedly brought the delay of local elections in Nineveh and Anbar to the attention of the federal supreme court). Nonetheless, Mutlak’s relative success in the reinstatement round along with his return to cabinet yesterday following his role in the recent passage of the annual budget in parliament with Maliki’s first “political majority” triumph of significance (the slim majority of 168 reportedly also included Free Iraqiyya and White among the Iraqiyya breakaway factions) are indicators of the continuing potential for cooperation between him and Maliki. Whereas many voices in Washington are critical of the recent passage of the budget in parliament because it was done in opposition to the Kurds, the fact that Mutlak now returns to cabinet in the middle of a crisis between Maliki and the Sadrists is actually not the worst thing that could happen in Iraqi politics. Still, with the decision by Maliki to run all-Shiite lists in the northern governorates, the chances for there to be much positive bridge-building towards people like Mutlak in the aftermath of the elections, as to some extent happened in 2009, remain limited. That in turn means that Maliki remains faced with the challenge of brining Sunni and secular partners more decisively into his on coalition if he wishes to persevere with the political majority project he so often likes to mention. Beyond the interesting political dynamics behind the recently declared delay in local elections in Anbar and Nineveh, an even more pertinent issue is beginning to receive some attention in Iraq: Is the delay legal? – Cabinet decides the elections date based on a proposal from the elections commission. – The elections must be held on a single day. – If elections are delayed, current provincial councils remain in power until new ones are elected. Article 49 goes on to stipulate that no measures that contradict this law are permitted. A prudent reading of this suggests the local elections law specifically envisions delay as a distinct possibility, but that such a delay should apply throughout Iraq. Partial delays seem impermissible, which is easy to understand given the legacy of heavily manipulated multi-stage elections in Iraq and the broader Middle East during the European mandate period. The law also seems to indicate the initiative should come from the elections commission. In practice, questions related to the security of the elections are known to have been delegated to a special security committee with joint membership of some IHEC board members as well as representatives of the interior ministry. The head of that committee is said to be Aydan Khaled, an interior ministry official who got into some trouble over the Hashemi affair and at one point last year was rumoured to have fled to Turkey and/or given early retirement. He now appears to be back in business (and is presumably once more friendly with Maliki), although it is unclear whether the security committee or the cabinet that was the driving force behind the Anbar and Nineveh postponement. In any case, the decision by the Iraqi cabinet on a delay limited to particular governorates seems illegal. It would be helpful if critics of Prime Minister Nuri al-Maliki spent more time complaining these specific transgressions to the federal supreme court – thereby forcing the court to at least speak its mind publicly – and devoted less attention to federalism schemes or to the arithmetic of the no confidence votes they plan all the time, but rarely bring to the phase of implementation.